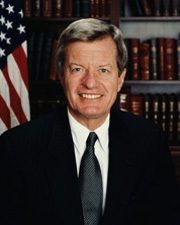 BAUCUS, Max Sieben, a Senator and a Representative from Montana; born in Helena, Lewis and Clark County, Mont., December 11, 1941; attended the public schools of Missoula and Helena, Mont. ; attended Carleton College, Northfield, Minn. 1959-1960; graduated, Stanford (Calif.) University 1964 and Stanford University Law School 1967; admitted to the Montana Bar in 1969 and commenced practice in Washington, D.C. with various federal agencies; returned to Montana and practiced law in Missoula; served in the Montana house of representatives 1973-1974; elected as a Democrat to the Ninety-fourth Congress in 1974; reelected to the Ninety-fifth Congress and served from January 3, 1975, until his resignation December 14, 1978; was not a candidate in 1978 for reelection to the House of Representatives, but was elected as a Democrat on November 7, 1978 to the United States Senate for the term commencing January 3, 1979; subsequently appointed by the Governor on December 15, 1978 to fill the vacancy caused by the resignation of Paul Hatfield for the term ending January 3, 1979; reelected in 1984, 1990, 1996, 2002, and 2008, and served from December 15, 1978, until his resignation on February 6, 2014, to serve as Ambassador to China; chair, Committee on Environment and Public Works (One Hundred Third Congress), Committee on Finance (One Hundred Seventh Congress [January 3-20, 2001; June 6, 2001-January 3, 2003], One Hundred Tenth to One Hundred Thirteenth Congresses [January 3, 2007-February 6, 2014]), Joint Committee on Taxation (One Hundred Twelfth Congress); vice chair, Joint Committee on Taxation (One Hundred Seventh Congress, One Hundred Eleventh Congress, One Hundred Thirteenth Congress [January 3, 2013-February 6, 2014]); U.S. Ambassador to China, 2014-.